Like most high school seniors, 17-year-old Sarina Shane looked forward to college with anticipation and excitement. But as Sarina stepped on the campus of Spelman College in Atlanta in fall 2014 the experience will mean a little more. She is taking advantage of an opportunity her parents never had—attending college. Sarina is a part of the Metropolitan Family Services federally funded Upward Bound/TRIO program, which helped one hundred promising students prepare for and suceed in college. 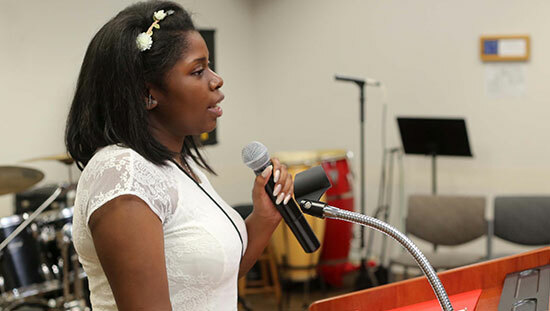 Throughout her four years at Gwendolyn Brooks College Preparatory in Chicago, Sarina worked with Metropolitan’s Upward Bound counselors to build the skills and tools for success as her family’s first college student. Already, Sarina has plans for when she graduates. “I want to work for an organization like Engineers Without Borders – to go to different communities and help people with the biggest need, not the biggest pockets. To be of service to those who need help.” Clearly, Sarina’s experiences in Upward Bound have had an impact in shaping her future goals.